Abstract : Estimating the noise power spectral density (PSD) is essential for single channel speech enhancement algorithms. 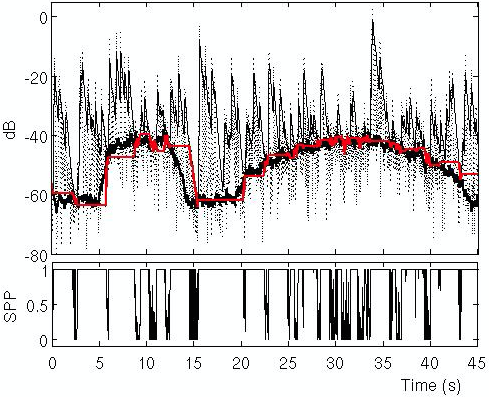 In this paper, we propose a noise PSD estimation approach based on regional statistics. The proposed regional statistics consist of four features representing the statistics of the past and present periodograms in a short-time period. We show that these features are efficient in characterizing the statistical difference between noise PSD and noisy speech PSD. We therefore propose to use these features for estimating the speech presence probability (SPP). The noise PSD is recursively estimated by averaging past spectral power values with a time-varying smoothing parameter controlled by the SPP. The proposed method exhibits good tracking capability for non-stationary noise, even for abruptly increasing noise level.